[Winner] Pipestone Area Friends of the Library: "Full 'STEAM' Ahead." Today, Meinders Community Library in Pipestone, Minnesota is home to a state-of-the-art makerspace – one that a public library in a community three times Pipestone’s size would envy. Its free resources range from 3D printers and stop motion animation equipment, to cricut machines and industrial staplers. A well-equipped makerspace represents a significant financial commitment, and one that Meinders Library did not make lightly. 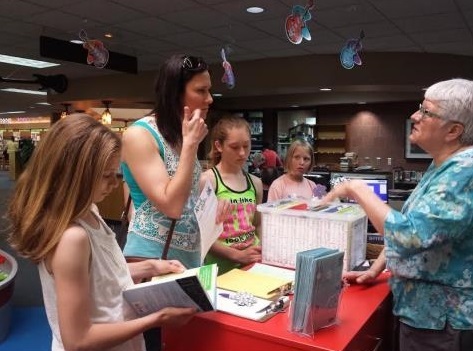 In order to gauge interest for and demand in these cutting-edge library amenities, the Library turned to the Pipestone Area Friends of the Library. On May 20, 2017, the Friends hosted “Full STEAM Ahead,” a celebration of science and creativity that showcased the various technologies available through a permanent makerspace. (For those unfamiliar with it, STEAM is an education acronym for Science • Technology • Engineering • Art • Mathematics.) In total, the program featured more than 25 free activities and presentations. Favorites included book binding, wool spinning, kite making and cricut crafting. Thanks to a robust publicity campaign and strong relationship with the area school, which adjoins the Meinders Library, more than 100 attendees of all ages participated in the day-long extravaganza. That healthy turnout approached the Library’s all-time event record – not bad, especially for a library with a programming budget of zero dollars in 2017. However, as the saying goes, nothing comes from nothing. The Friends donated 100+ volunteer hours to the planning and execution of Full STEAM Ahead. Other community volunteers contributed another 20+. Local businesses provided a complimentary lunch and refreshments for all guests. Full STEAM Ahead proved beyond a shadow of a doubt that the Pipestone area was ready for a permanent makerspace. After the program’s resounding success, the Library applied for a $25,000 grant through the competitive State Farm Neighborhood Assist® program. The Friends’ resounding success with the Full STEAM Ahead pilot set it apart from other applicants. Out of nearly 2,000 submissions, Pipestone was selected as one of only 40 to get the full $25,000 amount. [Finalist] Friends of Brainerd Public Library: "CLUE Book Club Murder Mystery." While board games are a popular pastime, they suffer from a drawback: the gameplay experience is a decidedly two-dimensional one. The Friends of the Brainerd Public Library turned that on its head last year with a wildly popular CLUE murder mystery event. Hosted at the Brainerd Public Library (where else? ), this first-of-its-kind role playing event brought to life the popular Hasbro game and its stately mansion setting. The Friends of the Brainerd Public Library are no strangers to experimental programming. In 2014, they won the Evy Nordley Award for “Wine & Words,” an author gala fundraiser. Last year, they were runners-up with “Books, Burgers & Brews,” a truly unique literary dining experience held in Crow Wing County restaurants and pubs. However, while these previous initiatives targeted the public at large, invitations to the CLUE Event were restricted to just one special audience: members of area book clubs. In the run-up to the big day, each area book club received a “summons” (delivered in ornate envelopes appropriately marked Confidential). More than 100 book club members answered that call. Many dressed in period costumes, complementing the Victorian veneer given to Brainerd Public Library for the day. “A local photographer loaned us backdrops, including bookshelves and a study, which really completed the setting,” DeChantal recalled. The Friends organizers tasked guests with solving a murder by visiting sixteen themed areas within the Library. Just like in the board game CLUE, players used process of elimination to zero in on a murder weapon, the scene of the crime – and its perpetrator. Going the extra mile, the Friends also secured an event liquor from the City and offered a free beer tasting. Hors d’oeuvres, desserts, and coffee were also donated by area businesses. Each attendee left with a Friends of the Library swap bag containing promo materials about the group and the Library, chocolates, and coupons for local breweries and coffeehouses. Impressively, thanks to in-kind donations, the Friends were able to put on the CLUE Event with only $200 of their own money. [Finalist] Friends of Buffalo Public Library: "Outdoor Reading Space." Buffalo Public Library enjoys an enviable piece of grassy shoreline along Buffalo Lake. Until quite recently, however, this sliver of prime real estate was an underused and unprepossessing spot. Limited, cramped seating was one reason. Overgrown landscaping – which harbored bugs but blocked the water view – was another. Dull paving stones and drab patio colors certainly didn’t help, either. Last year, The Friends of the Buffalo Public Library financed and coordinated a three-phase construction campaign to revamp and expand this waterfront courtyard. Funding came from several sources. Semi-annual book sale revenue, collected over two years, provided the lion’s share. Profits from “pop-up” book sales set up at farmer’s markets and garage sales helped as well. Last, private donations to The Friends solicited and earmarked for the project put the reconstruction above its budget target. In addition to the required fundraising, The Friends also took on the logistical and administrative challenges associated with this property upgrade. They sought bids and retained the services of a landscaping firm, partnering with city government on the approval of a design and repairs to an existing retaining wall, and consulted with the Wright County Horticultural Society about how best to handle perennial plantings. Phase 1 of the three-stage process supplemented the existing patio with a second one, plus provided a new hedge to shield the outdoor reading area from the parking lot. Phase 2 overhauled the existing patio with new, permanent seating and connected the two with a winding paver path. Phase 3 included various beautification and shade-giving measures. Work was paced in this way to allow construction to begin even before fundraising efforts hit the final budget target. Ultimately, “seating space was more than doubled,” noted board member Kay Stait. “Smaller groups or individuals can now feel comfortable sitting in twice the space, versus just a small circular ring with all the seating facing each other.” The renovations also showcase the beautiful, curated perennials that existed behind the Library previously but could not conveniently be viewed and appreciated. “We feel that we have succeeded in turning this portion of the library property into an outdoor space that will entice patrons and offer a place for reading and respite,” she concluded. [Winner] Marine on St. Croix: "Once Upon A River." The historic Marine Village Hall in Marine on St. Croix is Minnesota's oldest public facility of its kind still used for governmental purposes. However, on October 15, 2016, the 130-year-old building hosted something entirely new. The Friends of the Marine Library (aka Marine Library Association) hosted "Once Upon A River" at the historic venue. Marine Library Association marketed this unique performance as a blend of photography exhibits, live music, and more celebrating the beautiful St. Croix River and environ. More than 150 ticket holders turned out for this fundraiser. Headliners included artist Marty Harding and nature photographer Gary Noren, who shared the distinction of being selected as ‘Pine Needles Artists in Residence’ for the St. Croix Watershed Research Station – a big honor, for those in the know. Other highlights included the 30-member River Chorale, jazz and ragtime clarinetist Butch Thompson, and renowned pianist and accordionist Dan Chouinard. Given the environmental theming, the Friends were able to convince the St. Croix River Association, St. Croix Watershed Research Station (Science Museum of Minnesota), and the St. Croix National Scenic Riverway (National Park Service) to partner on the funding, design, and promotion of this first-of-its kind endeavor. Moreover, the Marine Library Association’s dedicated promotions team went all out, designing a well-circulated poster and securing plugs in area newspapers and other media. "Once Upon A River" packed the house and then some. Some hopefuls who had not purchased their ticket in advance could not get into the Village Hall, noted organizer Loralee DiLorenzo. (This is, as they say, a good problem to have.) Fortunately, some of the exhibits on display at OUAR are slated to enjoy a long second life in other Washington County venues. This includes the popular artwork of Harding and Noren. At the end of the night, the Marine Library Association had netted $7,735. Success is attributable not just to ticket sales and sponsorship support, but to the Friends’ stellar job securing in-kind donations for the program. This included over $3,500 in comped audio visual support from a local vendor, among other services. [Finalist] Austin: "Blind Date With A Book." In the run-up to Valentine’s Day, the Friends of the Austin Public Library set up fifty blind dates. But, this feat of matchmaking took a different form from what you probably have in mind! February fundraiser “Blind Date With A Book” generated several hundred dollars for the Friends, and invaluable exposure with new audiences in Austin.The idea stemmed from a board of directors brainstorming sessions last fall. The Friends wanted a fresh idea with modest costs attached – a tall order, as any fundraising volunteer can attest! Capitalizing on an inventory of like-new books they had on hand from a recent book sale, they decided to put a Valentine’s twist on the traditional Friends book sale model. They wrapped hundreds of books, representing a wide range of genres, in plain paper, which they then tapped into their artistic talents to ornament. They priced these anonymous “book dates” at $5.00 for a hardcover, or $5.00 for two paperbacks. As an added incentive for picky and curious readers alike, the organizers decided to include keywords and other clues on each. In addition to the library, the Friends partnered with a local coffeehouse to set up a table in a highly trafficked corner of downtown. “We decided we needed to move outside of the library to draw more attention to our group,” explained member Sue Grove. On sale days, Friends volunteered to “staff” the table at the coffee shop and handle transactions. Friends of the Austin Public Library received significant local publicity, including a front-page story in the newspaper and a feature on a popular radio talk show. All told, the Friends sold 50 wrapped books; with additional donations, they netted $393.00 over the course of the event (more than 50 percent above their target)! “’Blind Date’ is such a fun project to put on, and it can be easily replicated by any Friends group!” explained Grove. Given their initial success and the relative ease of scaling up the program, organizers are already committed to holding a sequel “Blind Date With A Book” in 2018. Next time around, they are going to expand their offerings to include children’s and young adult titles, and thereby make it an all-ages event. [Finalist] Brainerd: "Books, Burgers, and Brews." On March 20, 2017, literati in Brainerd dined on the “Mae Holland-aise Burger”: a truly unique entrée composed of bacon, cheddar, hollandaise drizzle, and a heaping side of literary inside jokes. Mae Holland is the plucky protagonist in The Circle by Dave Eggers. It is only one of many one-of-kind dishes prepared in recent months for the Friends of the Brainerd Public Library and their guests as part of “Books, Burgers and Brews.” The Friends inaugurated this innovative program in October 2016, in hopes of spreading the group’s fundraising and messaging to an inviting locale outside the library. Books, Burgers and Brews is held at Prairie Bay, a popular farm-to-table eatery not far from downtown. Each month, the restaurant's book-loving head chefs crafts a menu themed to that month's Friends book club selection. "Working together with the Library, we chose titles that we felt would be appealing to both men and women," explained organizer Sheila DeChantal. The first selection was sci fi favorite The Martian, by Andy Weir. That dinner drew about 35 attendees – and an encouraging high proportion of men. Attendance now tops 40 during any given month. Recent installments have included the non-fiction hit Hidden Figures (Margot Lee Shetterly), which centers around African American women at NASA in the 1960s and inspired the spicy pepper “Blast Off Burger,” and The Nest (Cynthia D'Aprix Sweeney), namesake of the fried onion Nest Egg Burger. Each month's dinner is accompanied by a short program, including a slideshow presentation and live author Skype discussions when possible. The Friends had initially planned to take a hiatus during the summer months, and pick back up in the fall. However, due to program growth and pending promotional opportunities, Books, Burgers and Brews is now held year-round. Moreover, the owners of Prairie Bay are actively exploring the possibility of bringing this novel book club idea to two other venues they own in the Brainerd area. In addition to greater awareness about the Brainerd Public Library and its Friends, the series has yielded other dividends, as well. The Friends purchase 20 copies of each highlighted title for the Library’s collection, and have leveraged “BBB” as a way to stoke interest in Brainerd's book-club-in-a-bag offerings. [Winner] Pipestone: "Night at the Museum." PAFL did just that on November 20 with its inaugural “Night at the Museum” – the largest ever library event hosted in Pipestone. [Finalist] Northfield: "Friends Bag Book Sales." Friends in small and rural areas are often tempted to use the modest size of their library, community, or member roster as excuses not to “think big.” Friends of the Elmore Public Library are proof positive that, with pluck and ingenuity, small Friends organizations can accomplish truly great things. Located an hour south of Mankato along the Iowa state line, Elmore is a farm town of only 600. Unsurprisingly, as of last year, membership in the local Friends was among the lowest of any organization in southern Minnesota. Consequently, many in the community voiced doubts when the Friends announced their intention to organize a large book basket silent auction as part of Elmore’s summer Horse and Buggy Days weekend celebration. While the partnership opportunity sounds straightforward enough on paper, it is a tall order for Elmore – a town with no grocery store, no bank branch, and little commercial activity to speak of. At present, Elmore sustains only six active businesses. In total, the Friends compiled a list of 88 recipients for a letter requesting basket donations for the library’s silent auction. Impressively, 53 of those contacted wished to take part! Kristin Travis attributes this response in part to flexible participation options. Donors did not have to devote time and effort to a themed basket if they did not want to. A cash donation option eliminated that barrier. In those cases, the Friends assembled an appropriate basket. All these efforts reaped a range of dividends. Exposure helped the Friends boost their profile and nearly double the size of their Board (from 5 to 9). Every auction item sold during Horse and Buggy Days weekend, allowing the Friends to buy a computer and needed software for the library. Moreover, “Basket Book-nanza” raised so much that the Friends had enough left over to buy the facility a new Cricut machine and about $200 worth in DVDs. Friends of the Elmore Public Library is eager to try their hand at this fundraiser again – but next go around, they aim to reach out to an expanded contact list of nearly 150 businesses. [Winner] Austin: "Holiday Book Sale." 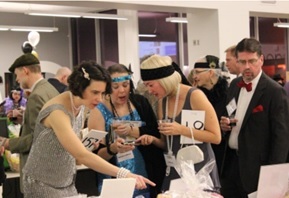 [Finalist] Friends of Ramsey County Libraries: "Second Annual Great Gatsby Gala." The $30,000 raised by the Friends will allow the Ramsey Co. Library to purchase 1,500 new items for collections in Maplewood, Mounds View, New Brighton, North St. Paul, Roseville, Shoreview, and White Bear Lake. [Winner] Spotlight on Brainerd: "Wine and Words." Author readings, wine tastings, and silent auctions are all common enough on their own, but it takes a hefty dose of creativity and planning to roll all three activities into one fundraiser. In August 2013, The Friends of the Brainerd Public Library did just this, with their inaugural “Wine and Words” program. Held at the beautiful Arrowhead Resort Hotel & Conference Center in Alexandria, Wine and Words featured not one, not two, but five accomplished writers: Sandra Brannan, Lorna Landvik, Sarah Pekkanen, William Kent Kreuger, and Wendy Webb. Authors and guests alike enjoyed an impressive spread, with sumptuous dishes like champagne chicken and wild rice pilaf scoring high marks. Delicious as the meal was, the real highlight for the palate was the wine tasting. Beverages were donated by a local liquor store. Indeed, The Friends of the Brainerd Public Library’s ability to find a number of generous partners (particularly ‘in-kind’ sponsors) proved crucial to their success. Arrowhead took care of author accommodations, and an area printer provided brochure and ticket printing free of charge. Local bookseller Book World facilitated on-site book sales for author signings. A number of businesses donated valuable items to the silent auction. Moreover, Wine and Words enjoyed a veritable blitz of promotions – at least when compared with what’s typical for Friends programs in a community the size of Brainerd. In addition to a strong social media presence, a new website, and favorable coverage in the Brainerd Daily Dispatch, that included comped radio spots. All this paid off. President Sheila DeChantal set what she thought was an ambitious goal of 100 attendees. “The results were well beyond our expectations,” she said. “We had 180 people purchase tickets!” Wine and Words cleared over $8,500 for the library’s use, and also served as an effective recruitment drive. “By having Friends applications at each place setting, we also increased our membership that evening by 24 members,” DeChantal reported. Needless to say, Wine and Words will be a staple on Brainerd’s community calendar from here on out! [Finalist] Spotlight on JFHML Foundation: "Cattale Corner." The “Land of 10,000 Lakes” has one more – and a decidedly unique one, at that! – thanks to the Jessie F. Hallett Memorial Library (JFHML) Friends Foundation. 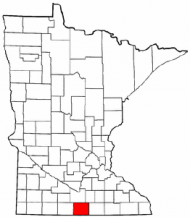 The Foundation services the small town of Crosby, Minn., and surrounding Cuyuna Lakes communities in Crow Wing County. Among other ongoing initiatives, Foundation members are particularly proud of the financial support they are able to provide the Hallett Memorial Library for children’s activities. In 2013 alone, the library hosted over 40 “Preschool Story Hours,” with total attendance topping 1,800. Without $1,000 from the Friends each year, this successful program could not continue. Recently, the Foundation seized on an opportunity to take this one step further. Inspired by various indoor play place prototypes they saw on display at the 2013 Minnesota Library Association (MLA) Conference in St. Cloud, and at the behest of staff, they decided to overhaul the library’s kids area. Crosby’s new-and-improved kids area is replete with the most modern of amenities, including two LeapPads and two iPads, but what children enjoy most is the overall atmosphere. As the Cuyuna Lakes area is defined by its many picturesque lakes, Friends thought it fitting to give the redesigned space an aquatic theme. Prominent is a replica boat for children to play in, together with a “pond” rug and both wall manipulatives and room decorations in keeping with that outdoors feel. Other props include model fishing poles and life vests. The Friends didn’t make all the decisions on their own, though. When it came to naming the rechristened space, they invited the public to put forward suggestions and vote on their favorite. Contenders included “Hickory Dickory Dockside,” “Kids Kabin,” “Little Lakeside Lounge,” and “Read-A-Book Beach.” Most popular of all was “Cattale Corner” (a literary pun on ‘cattail,’ a wetland plant found in abundance around the Cuyuna Lakes). Voters Phailed from all age brackets – a fact that proved prophetic. Cattle Corner is unexpectedly popular with adults, who appreciate the new outlet for their children’s energies (while they utilize the space’s fast and free Wi-Fi). [Finalist] Ramsey County: "Great Gatsby Gala." On February 1, after months of intense planning, the Friends of the Ramsey County Libraries pulled off a great fundraiser. A Gatsby-great fundraiser, to be more precise. Organizers tore a page straight from the Great American Novel and hosted a “Great Gatsby Gala” at the Roseville Library. The evening, emceed by Minnesota Public Radio personality Kerri Miller, contained several elements common to Friends fundraisers. Silent and live auctions boasted over seventy donated items ranging from one-of-a-kind specialty items, to gift baskets, to fun dining, theater and sightseeing experiences. The rest of the night was, as the name promised, a real blast from the past. Highlights included Roaring Twenties style dance lessons, a costume contest recognizing most authentic period dress, and a photo booth with Gastby-era props. Having never done anything of this sort, the Friends paid special attention to advance publicity. A press release and event updates were sent to local media outlets, and the Friends, in partnership with the Ramsey Co. Library, sent out a large mailing of their own. Social media and tried-and-true word of mouth also played a role. Commensurate with the party’s Roaring Twenties theme, planners set an ambitious fundraising goal of $20,000. By the end of the night, Ramsey County had met and surpassed that mark, with the live auction alone bringing in upwards of $8,000. After all was said and done, the Gala grossed $47,000 and netted nearly $35,000. This allowed the Friends to purchase more than 1,000 new items for circulation at library branches in Maplewood, Mounds View, New Brighton, Roseville, Shoreview, and White Bear Lake. The Cambridge Public Library is part of the 6-county, 14-branch East Central Regional Library (ECRL) system. ECRL is governed by a Joint Powers Agreement specifying that each member county must provide its full share of the annual ‘umbrella’ operating budget – or else face cuts the next fiscal year. In 2011, Isanti County’s Commissioners opted to cut their share of the ECRL budget by $34,000. As a consequence, Cambridge (the county’s only public library) saw a reduction from 57 to 43 weekly operating hours. More troubling still, the decision also necessitated cutting six part-time library staff positions and closing the facility entirely on Saturdays from Memorial Day to Labor Day. The Friends of the Cambridge Library quickly but judiciously determined that they could provide assistance on two fronts: helping close the 2012 budget gap, in the short term; and convincing the County to revert to the previous funding level, in the longer term. They tackled the first goal with gusto. Fundraising efforts ranged widely. Tactics included a letter campaign, petitions in the media, and donation jars in prominent places within the library. In total, they raised well over $5,000, enough to restore the summer hours – with some left over to put towards badly needed new furniture, to boot! Almost immediately after the budget reduction announcement, Friends treasurer Karen Lee and others began making it a point to attend the County’s open meetings with regularity. This ensured that library funding remained top-of-mind for the County Commissioners. Simultaneously, in hopes of securing a more viable budget for 2013, the Friends began making their case to government officials. They also spearheaded a grassroots public relation campaign, of sorts, to get the larger community (by and large fans of the library, even if not formally ‘Friends’) to voice their displeasure with the new status quo. Prominent among other efforts, they produced an informational flyer and mailed it to over 250 area households and businesses. In it, they made clear what the expenditures reduction meant for the library. The Friends encouraged recipients to forward on the information widely – and the community’s response surpassed nearly all expectations. Finally, at its September 5, 2012, meeting, the Isanti County Commissioners voted to fully fund the county’s share of the 2013 budget. One Commissioner stated: “I’ve never had more of a reaction from the public than I have on this.” Effective January 2013, the Cambridge Public Library is back to full staffing and operational hours. MALF’s Evy Nordley judging committee singled out the Cambridge Friends for their multifaceted, two-stage approach to an exceedingly complex issue. As an award nominee, its merits are almost too numerous to list. Foremost, at in the eyes of the judges, is the fact that it is replicable – a fundamental Evy Nordley criterion. We sincerely hope library systems elsewhere in Minnesota never face a budgetary crisis like this one. If you do, though, there’s hope… and your “Friends” in Cambridge have some great advice for you. Next to the traditional used book sale, an author event may be Friends of the Library’s favorite fundraising technique. Precious few, however, can do so as cost effectively as the Friends of Duluth Public Library – let alone bring in a New York Times bestselling author to headline. It began when President Linda Hanson and her colleagues began looking for a way to put on a public event well suited not only to raise funds for the library, but to increase public awareness of the Friends at the same time. The idea for an author series of some sort quickly gained traction. The Friends found an impressive partner for their debut event: William Kent Krueger, the award-winning author behind the popular Cork O’Connor series (set in Minnesota). Krueger agreed not only to speak in Duluth, but to use the Friends event as the platform to debut his newest novel, Trickster’s Point, for the very first time in northern Minnesota. Tickets were pre-sold for $20. The Friends hoped to sell an even 150 tickets, but ultimately sold 186! More impressive still, the Friends worked tirelessly throughout the summer (up to and including the September 17 event date) to see that the show was 100 percent funded through local sponsorships and sales. With ticket sales, net proceeds surpassed the $5,000 mark. Everyone reported having a good time (William Kent Krueger included). One lucky attendee, whose name Mr. Krueger drew from a hat, even came away with a promise that he would be featured as a minor character in the next Cork O’Connor story. Meanwhile, thirty miles up the road, the Friends of the Two Harbor Library tackled their own ambitious inaugural public event. Two Harbors is currently in the midst of a costly library remodeling project. The Friends elected to contribute to this fund through a large silent auction. After many hours of phone calls and leg work by Friends volunteers, over 100 community members (private and corporate) either donated items for the auction or contributed money to help offset costs. Wanting the caliber of their fundraiser to match the scope of the remodeling project, the Friends didn’t stop there. They also coordinated a whole night’s worth of entertainment to go with the auction. Live music, poetry readings, and a dessert bar drew in a crowd from all over Lake County. The fundraiser, dubbed the "Love Your Library Celebration," also saw monetary success. By the end of the night, $3,000 had been raised. Two Harbors is one step closer to having the library facility the community deserves! Photo Captions: MALF President Mary Ann Bernat congratulates Karen Lee (for the Friends of the Cambridge Public Library), Micky McGilligan (for the Friends of the Two Harbors Library), and Laura Bergen (for the Friends of the Duluth Public Library). [Winner] Ramsey County: "Become the Next Andrew Carnegie."